The American Revolution shook up the entire world. In the name of “Life, Liberty and the Pursuit of Happiness,” the thirteen British colonies that would become the United States of America, fought and won against the most powerful imperial power on the planet. The War for Independence was led by self-styled aristocrats like George Washington, but the actual fighting was done by small farmers, craftsmen and artisans, whites, blacks and Native Americans, freedmen and slaves alike. But once the dirty work of the Revolutionary War was finished, what was to replace the rule of King George III? The new oligarchy – including the bankers of the East Coast and the plantation owners of the South – were divided as to how they should rule. Some wanted a republic; others favored a limited monarchy, with George Washington as the prime candidate. Some wanted to ally with the French, others with their old enemy the British. Some wanted tighter centralization, others a loser federation. But on one thing they were all united: all the revolutionary rhetoric about freedom and justice was to apply only to free men who owned significant amounts of property. Slaves, women, poor whites, blacks, and Native Americans need not apply. In order to consolidate their power, a political counter-revolution was necessary. They had to put the “unwashed masses” – who believed they had been fighting for genuine freedom for all – back in their place. In the years following the American victory over the British, the hopes of the masses were betrayed. As a result, there were many popular movements and uprisings against the squeezing of the poor by the big bankers and corrupt government officials. But none had as big an impact on the psychology of the ruling class and the future structure of the U.S. government as Shays’ Rebellion of 1786-87, which some have called “The American Revolution’s Final Battle.” The Massachusetts uprising of the “Shaysites,” as they were called, was a defining moment in U.S. history, an outstanding example of the class contradictions and revolutionary traditions built into the very bedrock of American society. The many similarities and parallels with political struggles and revolutionary movements in our own times are striking. This was clearly the case in the Americans’ struggle against the British Empire. The revolutionary-democratic ideas of the Enlightenment and the fiery rhetoric of propagandists like Thomas Paine and Samuel Adams aroused the toiling masses to believe another world was possible and worth fighting for. However, when the masses, who have sacrificed life, limb, livelihood, personal comfort and property, find their aspirations betrayed, they become more than a little dejected. And when they realize that after all their efforts to kick out the old rulers, another exploiting group has encrusted itself atop society, they can embark on more or less desperate attempts to keep the momentum of the revolution going, to try to go beyond the material limitations and/or the leadership. For example, during the English Revolution of the mid 1600s, there were the “Levelers” and the “Diggers,” who envisioned and thought they were fighting for a truly egalitarian society. This, despite the fact that at that time, the only kind of “communism” materially possible was a “communism” of distribution, and not genuine communism of production, distribution and exchange. In the end, although they had been some of the most fervent anti-monarchists and revolutionary democrats, Cromwell was compelled to crush them, once the economic and political rule of the bourgeoisie over the feudal lords, monarchy and Catholic Church had been more or less consolidated. Although we cannot make direct and mechanical historical analogies, the Shaysites in the aftermath of the American Revolution represented a somewhat similar phenomenon. They wanted to go beyond the limits of what was materially possible at that time. They wanted genuine political and economic democracy for all, when the only form of democracy possible at that time was bourgeois democracy, which is limited by its very nature. Two hundred years ago, capitalism was still in its historically progressive phase. In other words, it was still able to develop the productive forces of humanity, despite being a system based on the exploitation of the many by the few. Increased concentration of wealth, technology, and productive capacity was a necessary phase of human social development, laying the material foundations for socialism, a society in which there must be a high level of technology and productivity to ensure there is more than enough to go around. Therefore, the struggle of the Shaysites, yeoman farmers who represented an earlier, less efficient form of production, was doomed from the start. After throwing off the British yoke, the embryonic American bourgeoisie set out to consolidate their power and conquer the rest of the continent, starting with the backwoods areas of the original thirteen states themselves. At this stage, the thirteen states were more or less independent of one another, with their own governments and laws. They had banded together in the struggle against the British, loosely bound together by the Articles of Confederation, and overseen by the weak Continental Congress, but there was no consensus as to whether or not and in what form this relationship should continue. Shays Rebellion would profoundly shape that relationship. One of the fundamental contradictions in the newly independent United States was the conflict between the East coast and the Western interior. Even at this early stage of the new republic, clearly conflicting class interests and worldviews were evident in this dichotomy. The commercial interests on the Eastern seaboard, representing nascent capitalism, clashed with the interests of the inland small farmers. As for the question of chattel slavery in the South, that was to be dealt with by Northern capitalism eighty years later, in the 2nd American Revolution, or what was really the full consolidation of the 1st: the Civil War. That, however, is the subject of another article. In the late 1780s, the U.S. was primarily a country of small farmers. An estimated 70 percent of the population were yeomen farmers, free holders cultivating their own land. The rest were mostly craftsmen, artisans, slaves, small shopkeepers, professionals, merchants, bankers, government officials, and the like, not to mention the Native American population. The modern urban working class as we know it today existed only in an extremely embryonic form, working in a relatively small number of rudimentary manufacturing workshops, usually employing only a small number of workers. Generally speaking, the rural economy was based mostly on barter and exchange of labor, not money. As a result, these small free holders had something of a collective mentality, despite the inherent “rugged individualism” of their lives. While each had their individual properties, they relied on each other to combat the elements, to raise their barns and get in the harvests, and to defend themselves against “hostiles” (Native Americans whose land was being encroached upon). The early democratic traditions of the Puritans, the people’s militias, “town hall” and other community meetings still remained in some form or another in many areas, especially in New England. This was quite different from the outlook of the bankers, merchants, government officials, lawyers, clergy, etc. in the coastal cities and inland towns. Their world view was shaped by the individualism of the capitalist market and the need for cold, hard cash. Between these two increasingly polarized groups were the country retailers, small shopkeepers who would buy goods from the coast and sell at a profit to the interior. The coast was dominated by for-profit production and importation for the market, whereas the small scale subsistence farming and barter of the interior was not. Within the U.S. itself, therefore, we had the phenomenon of “uneven and combined development,” of more advanced productive forms (early capitalism) grafted onto and coexisting with earlier, less productive forms (small scale farming). In the final analysis, the more productive and efficient mode of production will predominate, and in time it did; but at that time, the sheer numbers were still in favor of the small producers. However, momentum and history were on the side of capitalism. The commercial lenders were increasingly penetrating the traditional economy, drawing small producers into market-oriented production by offering manufactured goods in exchange. The interior of the country was in effect a colony of the coast, trading labor-intensive agricultural goods for more expensive manufactured goods, similar to the U.S. relationship with Latin America today. The surplus agricultural produce was then sold on the world market for a profit. A chain of debt was established, whereby the country retailers owed the coastal banks and importers of manufactured goods, and the small farmers owed the local retailer. When the American colonies were still part of the British Empire, they had enjoyed special trading privileges and access to credit. In addition, there was a bonanza of profiteering and lucrative smuggling during the war. But with the war over, and having to make its own way in the precarious world of the late 18th century, the U.S. economy entered a depression. There was a glut of goods, stockpiled on the basis of high wartime prices and speculation, and prices now collapsed. The banks and merchants put the squeeze on the country retailers who owed them for goods received, and the retailers in turn demanded payment of debts from the small farmers. Traditionally, the rural population could pay back its debts through barter. For example, for a bag of nails or an axe received from the small retailer in the Spring, the farmer could pay back the debt with a certain number of bushels of wheat delivered in the Fall. But the country retailers now demanded repayment in hard currency, as the banks and merchants on the coast needed the cash to re-establish terms of credit with the British and other trading partners. The state governments, overwhelmingly representing the interests of the urban elite, were also levying taxes, also to be paid in cash. Hadn’t one of the rallying cries of the revolution been “No Taxation Without Representation”? Conflict was inevitable. As the debts piled up, many farmers had their lands confiscated and some were even thrown into debtor’s prison. Their land was sold to speculators below its value, and thousands of independent farmers feared becoming tenant farmers on their own land. After fighting against the British, they were being subjected to a new kind of tyranny. Even if they were not directly affected, they were angry at the way their family and neighbors were being treated. In fact, a recent survey of documents from the era shows that family connections seem to be one of the most important factors driving participation in the movement. The class lines were clear: there were no country retailers or rich merchants being jailed, just small farmers, often losing their land, or forced to move even further west. A similar process was repeated in the Dust Bowl in the 1930s, dramatically portrayed in The Grapes of Wrath. A similar phenomenon continues across Latin America and elsewhere around the world today. In North and South Carolina, as well as other states, similar “Regulator” movements emerged. Generally speaking, they respected the law, but they wanted to “moderate” or “regulate” the government. They aimed their frustration at the court system, in order to prevent the “too rigorous execution of the law.” The Shaysites in Massachusetts started out with similar aims. But as can be seen in every revolution, even the most minor reforms cannot be tolerated by the ruling class, even if they are in keeping with the existing legislative channels and limits of society. These people are accustomed to rule in a certain manner, and do not want to change their ways or appear to bow to pressure from below. Like the Russians in 1905, the Shaysites first attempted to petition peacefully for relief. They appealed to the government to lower taxes, to introduce paper money in order to lessen their debt load, and to legalize the use of barter, in order to pay off their debts with agricultural products. They also demanded the closing of the debtor’s courts. But the rich creditors rejected all of this; they dominated the government after all, and they blamed the rural population for their “extravagant” spending. The same “blame the victim” policy can be seen time and again in our own times. Instead of backing off, the government passed even stricter laws and increased the repression and squeezing of the debtors. As so often happens, the “whip of counter revolution” spurred the movement on further. The rejection of their reasonable petitions for reform further radicalized the movement. There was discontent in urban areas as well, with food riots, as in Paris before the French Revolution of 1789, just a couple of years later. Many of those being thrown into prison were veterans of the Revolutionary War, and being frontiersmen, had something of a “Wild West” mentality and a tendency to “take things into their own hands.” In what could be made into a script for a Hollywood movie, the powers that be “picked on the wrong guy.” Daniel Shays was a former Captain in the Continental Army and a hero of the Revolution. He was twice brought to court, a humiliation for any hard working man or woman just looking to get ahead in life, but doubly so for someone who had not long ago received an honorary sword as a gift from the French General Lafayette himself. Like many revolts against early capitalism, most famously the Luddites, the Shaysites’ outlook was naïve and Utopian. They wanted to go backwards to a pre-capitalist form of production, to an imaginary society of freedom and plenty for all. Their struggle was therefore doomed from the start; the tide of history was not on their side. The rebellion was still in its reformist phase; it was not yet a fully-fledged revolutionary movement aiming to overthrow the status quo. But the reaction of the ruling oligarchy was rabid. They referred to the Shaysites as a party of madmen, and railed about the “fury and madness of the people.” They were horrified at the burning down of the courthouses, and launched a sort of “red scare” and panic because the authority of the state was being subverted. They declared that this was anarchy, and they blamed conspiracies by spies or by the British. The Governor of Massachusetts, James Bowdoin, rallied the wealthy to unite against the rebellion in their midst: “Every man ought to show his colors and take his side; no neutral characters should be allowed, nor anyone suffered to vibrate between the two.” This too is reminiscent of our recent McCarthyist past. As so often occurs in history, what was once progressive is transformed into its opposite and becomes reactionary. Whereas at one time they armed themselves against the British, the “Founding Fathers” now armed themselves against the masses and an 18th century version of the Patriot Act was passed. At this time there was as yet no national army. Each state had to provide and pay for its own security. But in the Massachusetts militia there were mutinies of rank and filers who sympathized with the Shaysites. Some merchants were so terrified by the tide of events that they even considered inviting a foreign monarch or some kind of Napoleonic strongman to come in and restore order and save private property, which is what would eventually happen in France. As one merchant wrote, “Monarchy is better than the tyranny of this mob.” Noah Webster of dictionary fame said, “I was once as strong a Republican as any man in America. Now a republic is the last kind of government I should choose. I would infinitely prefer a limited monarchy, for I would sooner be the subject of the caprice of one man, than the ignorance of the multitude.” So much for “We, the People”! They called for 1,340 troops to be raised in order put down the Massachusetts militants. As there was growing sympathy for the rebellion, the government claimed the troops were needed due to “Indian troubles.” This was the beginning of the national army in what would become the United States, as opposed to the strictly state-based militias. But since there was no central control over monetary policy, there was no way to compel the states to raise money for the troops. So the Boston merchants took matters into their own hands, paid out of their own pockets for the raising of an army, and sent armed expeditions to punish the Shaysites. Once again, the whip of counter-revolution, drove the Shaysites further. They now adopted an openly revolutionary attitude. They feared the total loss of their freedom and now believed, as one of them later said, “that it was better to die by the bayonet, than by the halter.” They kidnapped several country retailers and started forming local committees of the people to run their own government. They adopted guerrilla tactics used in the War of Independence and decided to march on Boston to burn it to the ground. And then, an accident of history took the wind out of the movement. In January of 1787, as they were marching on Springfield, Massachusetts to take over the armory, the Shaysites were caught in a snowstorm and surprised by the troops sent from Boston. A handful of the rebels were killed and wounded by cannon fire, and they dispersed to the north. Over the next few weeks, some 1,000 of the atomized Shaysites were arrested, effectively ending the rebellion. At his trial, Shays denied being the leader of the movement, not because of cowardice, but because all decisions had been made democratically in popular assemblies. Several rebels were fined and imprisoned, and two of them, John Bly and Charles Rose, were hanged. But such was the sympathy the so-called Shaysites aroused in the population, that by 1788, Shays and most of the rest of his followers had been pardoned and released. Shays eventually moved to the Conesus, New York area where he died in anonymous poverty in 1825. He is buried in the Union cemetery. But it was more than repression and bad luck that ended the rebellions of the “regulators.” Two hundred years ago, there was an important safety valve for the accumulating class contradictions: escape to the West. In the end, many former Shaysites simply left the United States and moved into new territories, out of the reach of the government. 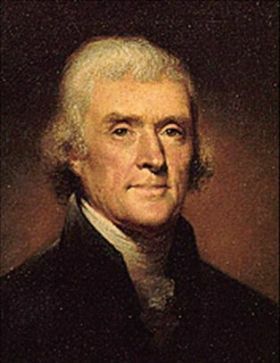 Thomas Jefferson The Shays uprising was just one of many outbursts of the class struggle that helped shape early American history. It had a powerful effect on what was to become the U.S. Constitution. After the events of 1786-87, a majority of the decision makers in the loosely confederated states were won over to the Federalists’ arguments in favor of a stronger central government. They had seen in practice the need to pool their resources in order to, among other things, provide for a standing army to put down civil unrest. Their fear of the revolutionary initiative of the masses, and the threat to their property and privilege, trumped all the lofty rhetoric about “liberty and justice for all.” In the end, the U.S. Constitution, held up as a model of democracy, order, and stability, was passed by just 1/8th of the population – the “frightened men of property” – as author Gore Vidal describes them. It is perhaps fitting to end this brief history of the Shaysites with the following famous words by Thomas Jefferson, written about the Shays uprising while he was serving as ambassador to France: “A little rebellion now and then is a good thing. The tree of liberty must be refreshed from time to time with the blood of patriots and tyrants.” Although the right wing “Tea Party” movement has of late hijacked these lines for themselves, their true meaning is the following: in a genuine democracy, the majority should rule. In modern society, the working class is the overwhelming majority, and should, by rights, be the masters of their own destiny.